Waterloo – Two Wilfrid Laurier University faculty members, Jennifer Baltzer and Shohini Ghose, have been selected for membership in the prestigious College of New Scholars, Artists and Scientists of the Royal Society of Canada. Baltzer is an associate professor of biology and Canada Research Chair in Forests and Global Change while Ghose is a professor of physics and director of Laurier’s Centre for Women in Science. 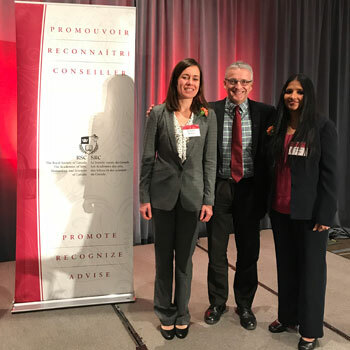 Both have received other prestigious awards in the past, including an Ontario Early Researcher Award for Baltzer and membership in the international TED Fellows program for Ghose. Baltzer, whose Canada Research Chair was recently renewed, has studied northern, tropical and temperate forests and has made important contributions in each of these climatic zones. She is a key member of the Government of Northwest Territories-Laurier partnership science steering committee and Laurier’s lead in the Global Water Futures partnership, a $78-million Canada First Research Excellence Fund initiative led by four universities. She has also developed substantial collaborations with the Smithsonian Institute and NASA, both of which serve to deepen understanding of changes in northern boreal forests. In addition to her Laurier roles, Ghose is a fellow of the Balsillie School of International Affairs, an invited affiliate of the Perimeter Institute for Theoretical Physics and the University of Waterloo’s Institute for Quantum Computing, and adjunct professor at the University of Waterloo. She is vice-president-elect of the Canadian Association of Physicists and associate editor of the Canadian Journal of Physics. She and her colleagues made the first observations of cesium atoms that showed a connection between chaos theory and quantum physics. A well-recognized expert, she has given many high-profile talks around the world and regularly speaks to international media organizations. The College of New Scholars, Artists and Scientists is a body that the Royal Society of Canada established in 2014 to recognize the emerging generation of Canadian intellectual leadership. Members are Canadians and permanent residents who have demonstrated a high level of achievement at an early stage in their career. Membership is for seven years. Ghose and Baltzer will be officially inducted in November at a ceremony in Winnipeg. They will join three other Laurier colleagues who are already members of the College: Alison Blay-Palmer, Alison Mountz and Anne Wilson. Blay-Palmer and Mountz became members in 2016; Wilson in 2014.